IPOB under the supreme command of Mazi Nnamdi Kanu De Great is still leaving door open for Justice Binta Nyako who is presiding over the case of treasonable felony instituted against the IPOB leader and other 3 defendants by government of Nigeria, to hands-off the case and locate the exit door out the travesty of justice masterminded by Gen Buhari come 12/1/2017 or risk being partakers of doom ahead. The reason why Justice Binta Nyako should step aside from the case on 12/1/2017 is because she had put herself in a tight corner in the said case and can no longer withdraw, overturn and reverse her previous reckless rulings. There is no how she should convict Nnamdi Kanu before trial and the world will keep quiet without objection since Nigeria judiciary is not an enclave operating in solicitude. If you allow mask witness or shielded witnesses without the prosecutor first tendering enough exhibits that will satisfy court to have a belief that the accused may truly be a terrorist after trial, then it simply meant that you have already convicted Nnamdi Kanu before his trial which will be tantamount to a clear injustice. 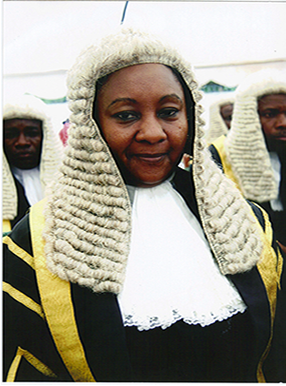 Upon this reason, the only available option left for Justice Binta Nyako is to save her judicial career, reputation and conscience by removing her name in the mess which Nigeria executive and judicial arms of government have jointly done to the courts of Nigeria. From all indications, occasion has not arise that will warrant a witness to testify against Mazi Nnamdi Kanu in private because the court has not seen enough exhibits of terrorism in order for the attorney-general of Nigeria to rectify a witness as empowered by Section 36 (6) of 1999 constitution of Nigeria as amended. It is important to ask Justice Binta Nyako questions like who is actually blackmailing her. Does she actually understand the nature of the case which she is handling? Justice Binta Nyako should say no to that blackmail and hands-off the case to save herself come 12/1/2017. If Justice Binta Nyako fails to heed this warning to hands-off this case, she has deliberately committed intentional suicide. She has committed intentional suicide because, such a type of trial cannot take place in a democratic Nigeria. It was only in Gen Buhari military regime that such trial took place and cannot be now. The eyes of the world are upon the case and any move to go outside the stipulated judicial laws in the land will always be rejected until the right things is done and the right thing can no more be done in this regime of Justice Binta Nyako which she has messed up the trial with her previous obnoxious and questionable rulings. Binta Nyako should resign to save Nigeria judiciary from collapse. It has become obvious that Nigeria judiciary does not want to do the right thing in this case. Nnamdi Kanu is few days away from being declared internationally as a prisoner of conscience. If Nigeria government under Gen Buhari is afraid of open trial, then they do not have case against Mazi Nnamdi Kanu. It is up to Justice Binta Nyako to heed the advice and hands-off for a competent judge to take over or refuse to hands-off and have herself to blame in a near future. I rest my case. From Onyebuchi Eze (Nnamdi Kanu Disciple) of Family Writers.